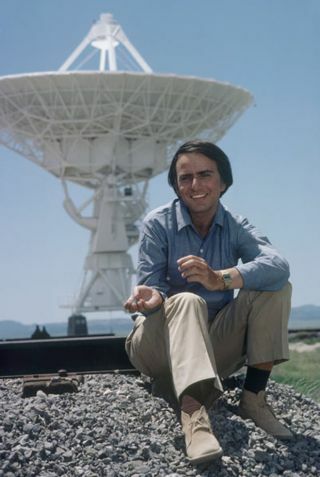 Carl Sagan at the Very Large Array in New Mexico. Fans of the late astronomer Carl Sagan's "Cosmos" have even more to be excited about this weekend. Leading up to Sunday's premiere of the new "Cosmos" reboot, hosted by Neil deGrasse Tyson, the National Geographic Channel will air a marathon of the original 1980 TV series. The next-generation version of the show, "Cosmos: A Spacetime Odyssey," aims to have the same broad appeal with Tyson, already well known as a science popularizer, as host. Two of the original show's writers, Anny Druyan and Steve Soter, are also behind the revival, as is "Family Guy" creator Seth MacFarlane. The new "Cosmos" airs Sunday (March 9) on Fox at 9 p.m. EDT and Monday (March 10) on National Geographic at 10 p.m. EDT. 6 p.m. - Who Speaks for Earth?